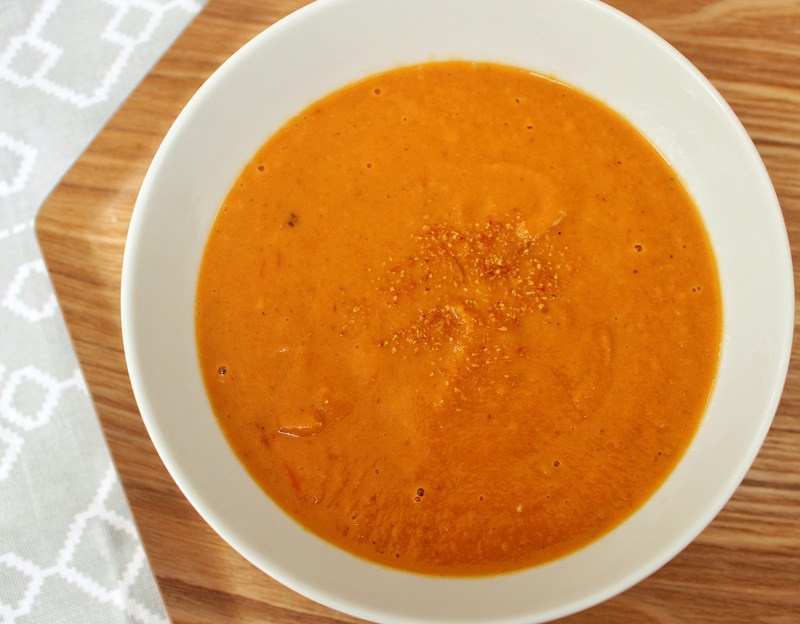 Roast tomato, sweet potato, ginger and coconut soup | dash.drizzle.dollop.devour. It’s nearly the wrong time of year for soup, but with the cold snap this week, I thought I’d squeeze in another batch. We’re on the cusp of all the lovely spring veg now, so I’ll be leaving the root vegetables behind soon, but this is just the thing for a rainy spring afternoon. And oh I love this recipe! It’s so thick, rich, sweet and creamy, it feels satisfyingly filling and warm in your stomach, I could eat it all in one go. The first time I made this my mum ended up doing most of the making whilst I looked after the little one who has a knack for knowing when I’m in the middle of something! I remember tasting a spoonful in the blender and it had come out just perfectly, no additional seasoning needed or anything. I bought all the ingredients again the next weekend, it’s just the best soup I’ve had in a long time. Start by roasting your tomatoes. It’s really worth doing this, especially if you’re using winter supermarket tomatoes which lack some of the sweetness of summer grown ones. Halve about 500g tomatoes, drizzle over a little olive oil and add a sprinkle of salt. Roast in a hot 180C fan oven for 45mins to an hour, until blackened and starting to collapse. Meanwhile, roughly dice half a red onion and gently fry in a spoonful of coconut oil if you have it, or olive oil. Peel and dice 2 medium sweet potatoes, about 300g, and add to the onions. Add about 3cm fresh root ginger, peeled and chopped and a couple of cloves of garlic. Cover with 500ml vegetable stock and bring to a simmer. Cook for around 20 minutes, or until the sweet potato is tender. 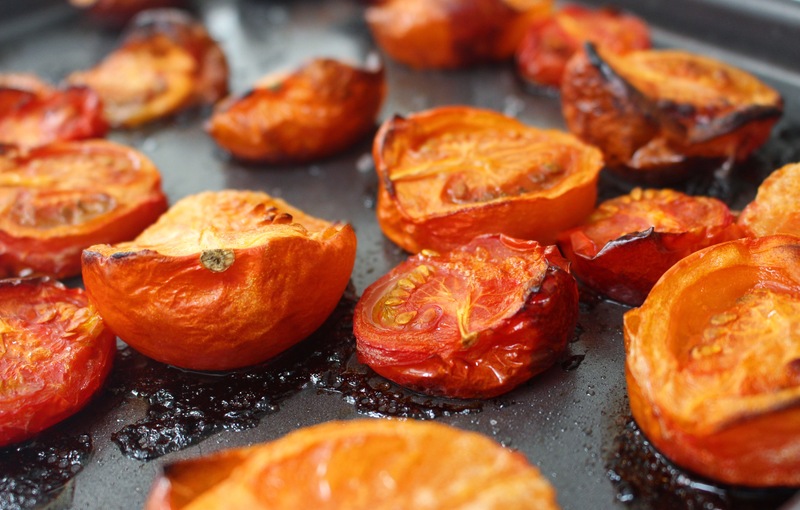 Add your roasted tomatoes to the pan, make sure to scrape in all that lovely sweet tomato juice from the tray, although it’s also lovely to mop the tray with a slice of bread! Add 200ml coconut milk and cook for another 5 minutes. Blend until smooth. This is very thick, you might want to add more water or stock to get to a consistency you like, but I like it like this. Add extra seasoning as needed. Add a few chilli flakes on top or a drizzle of cream to serve. Would probably serve 3 or 4 people, but I normally enjoy two very large bowls of this. Allow an hour and 15 minutes for cooking before you want to serve. I made this last night, an evening in when I knew the family would be out until quite late. This soup is a triumph, tastes even better than expected and easy to prepare. As I sat eating, alone, I serious considered hiding the rest of it at the back of the fridge and not letting anyone know of its existence, to be finished another time, in secret. But my generosity of spirit got the better of me and I served it up when they came home hungry and tired. An all-round success, to be repeated. Incidentally, I made it with pale ‘essential’ supermarket tomatoes, so I look forward to making it later in the summer with proper ripe summer tomatoes.